I got to try out the new Pacific Cycles Integrated Folding (IF) bike designed by Mark Sanders. This bike is something like a full sized version of the Strida folding bike. Like the Strida, it folds in half quickly, with unique uni-“forks” so the wheels lay flat against each other. James at Bicycle Design is a big fan of Mark Sanders. This bike has the Schlumpf two-speed crank, 26″ tires, and weighs about 28 lbs. 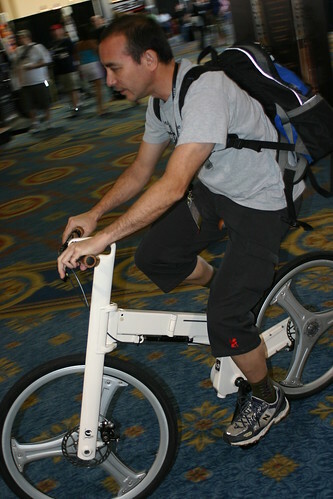 When folded it can be toted on its wheels. A fully enclosed chaincase helps to minimize mess from the chain. Pacific Cycles is lining up USA dealers for this bike at the show. Retail should be somewhere around $2000. How was it to ride? Has this Pacific Cycles IF Mode made its way to retailers in the NY metro area yet? Any reviews yet on the IF Move, a similar but less expensive 20″ version of the IF Mode?